All lovers of the mountains will welcome Verna Johnston's new and completely updated edition of her classic, Sierra Nevada, originally published in 1970. A professional biologist, veteran ornithologist, and well-known wildlife photographer, Johnston is the perfect guide for a natural-history trip into the Sierra. Regardless of how one explores the magnificent 400-mile-long mountain range, on foot or by car, in an armchair or a classroom, this is the book to have. Beginning with the western foothills, Johnston evokes a vivid picture of the varied plant and animal life encountered as the elevation increases, tops the crest, and drops to the more precipitous, arid eastern Sierra slope. The reader is taken through chaparral and mountain meadows, pine and fir forests, granite expanses and snowy peaks. Johnston writes of the Native Americans' uses and stewardship of the land, the role of fire in forest ecology, the eras of sheep herders and loggers, the work of John Muir and other preservationists, and the battles to save Mono Lake and Lake Tahoe. Her lifetime of field experience and discovery offers intimate observations of rarely recorded events: the courtship of the Sierra Nevada salamander, a wolverine attacking two bears, a fight to the death between a skink and a scorpion. 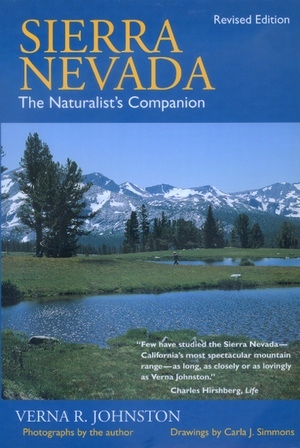 Many changes have occurred in the Sierra since the first edition of this book was published, including acid snow, tensions involving human and cougar habitats, and an ominous drop in amphibian populations. Johnston documents these events and updates the ecological research in the rich, evocative writing style that makes her book a naturalist's treasure. This is a guide to the Sierra Nevada for the next millennium. Verna R. Johnston, who taught biology at San Joaquin Delta College for thirty-seven years, is a natural-history writer and photographer. A Japanese edition of her most recent book, California Forests and Woodlands (California, 1994), has just been published. Her photography has appeared in numerous exhibitions, and more than 100 of her articles have been printed in Audubon, the Christian Science Monitor, Encyclopedia Britannica, the New York Times, and other publications.